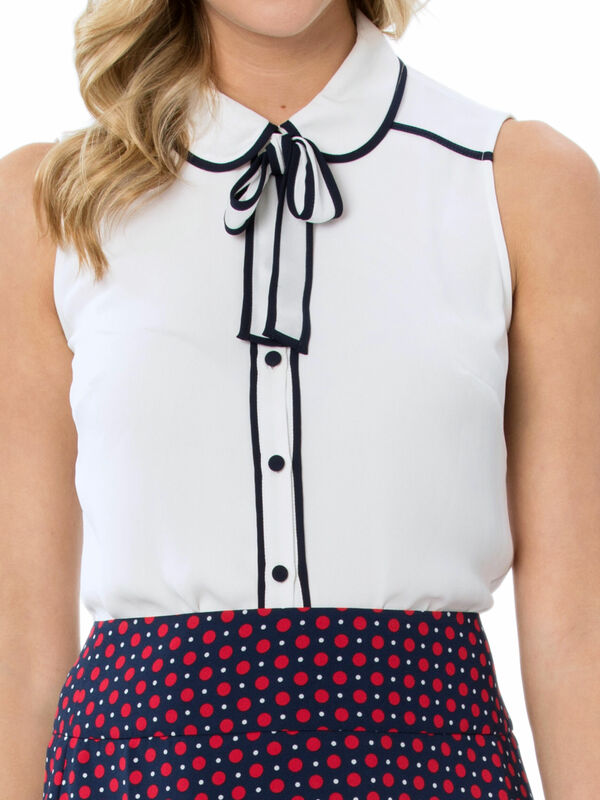 Tulisa Blouse https://www.review-australia.com/au/tulisa-blouse-white-navy/RE19TW042.REWHT032.html Both preppy and pretty, the Tulisa Blouse is a summer staple. In classic colours, this sleeveless blouse is easily paired with (nearly) all colours of the rainbow. 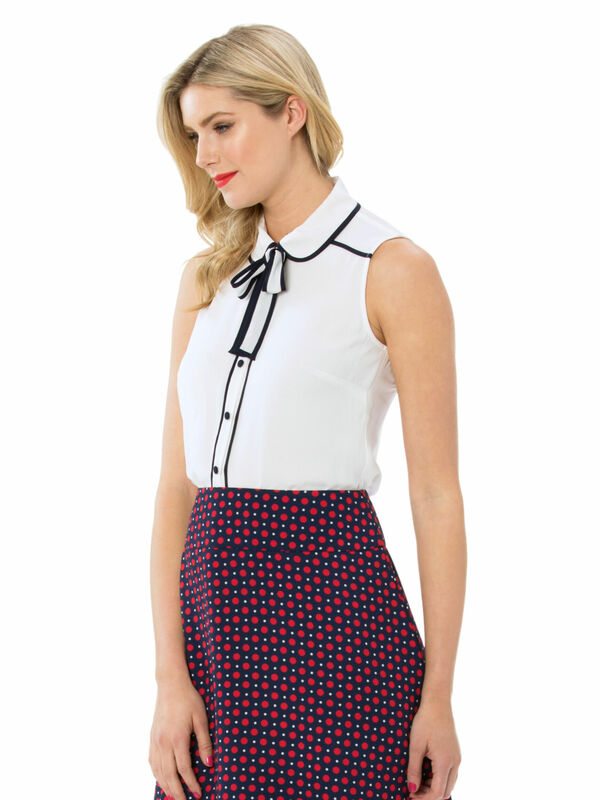 The peter pan collar and bow are signature Review touches. Tulisa Blouse is rated 4.8 out of 5 by 31. Rated 4 out of 5 by Joyful from Beautiful blouse but the colour ran when washed I washed this blouse on its own using my normal laundry detergent and was extremely shocked to see that the navy blue piping had run onto the white! Devastated, I brought this to another store to get an exchange. I was advised to use a different type of detergent, perhaps something much gentler. This is a beautiful blouse on although due to the white colour, it is a little sheer. I had to wear a white singlet under this so you couldn't completely see my bra. Rated 5 out of 5 by Review Addict 91 from Best new staple! I love this top so much! Wear it all the time with my other review pieces such as the Arlo skirt, and my navy Demelza skirt from a previous season. I also take the bow off and wear them with my spot surprise trousers. It's a little sheer at the back, but the front has a double layer so it's quite opaque. Lovely and cool too, perfect for the warmer weather ! Rated 5 out of 5 by Just_living_life from Preppy Fun I love that this top is fun but neat. 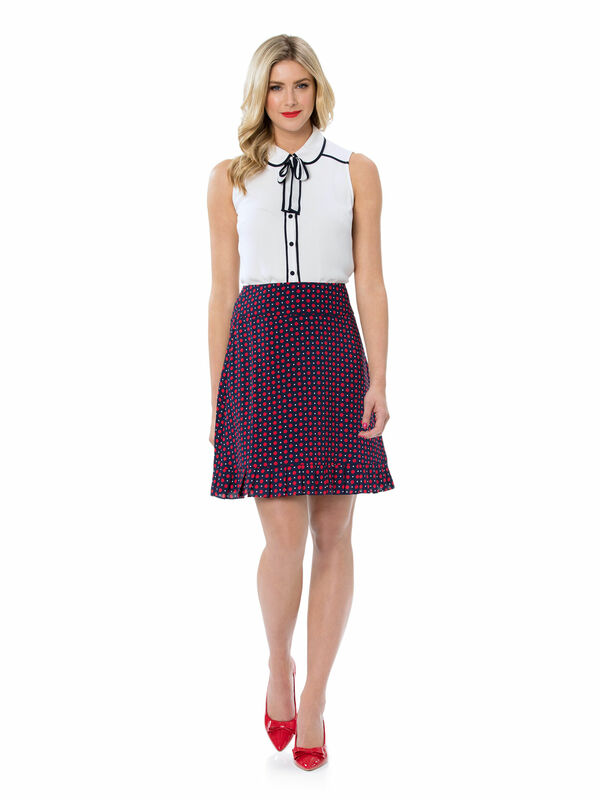 The navy blue piping gives it a nice tailored feel, while the Peter Pan collar and bow add some feminine fun. The fabric is beautiful and soft, and the shape means it can be worn with high-waist or regular fitting bottoms. I think I’ll be wearing this one over and over! Rated 5 out of 5 by Annarhz from Super cute I wasn’t expecting to find anything. I’m a size 14 and many of Review clothing is better fitting on petite/thin ladies. I tried this on and I instantly loved it ! Got a lot of compliments from it too. 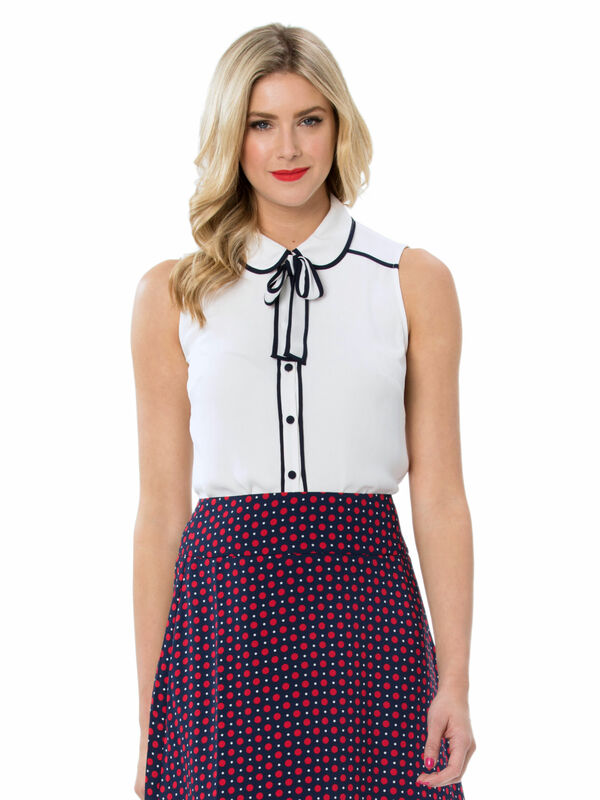 It’s cute yet it can be dressed up for office wear. Rated 4 out of 5 by unknown from Very Pretty I bought this a few weeks ago, It was a great price, very happy with that, I wasn't entirely happy with the bow that is permanently tied or that the back the shirts very see through. but other than that its great & very pretty. Rated 5 out of 5 by Gill75 from Elegant and Delightful I love the navy piping, collar and bow. It is a looser fit which is great in the armer weather. Have worn to work a numner of times in January and you always get a compliment! Like the picture it goes well with a red lipstick!! Rated 5 out of 5 by Cath_80 from Beautiful blouse, lots of compliments! Love the details of Tulisa - the bow and Peter Pan collar are on point! Love the navy piping, and little gather detail at the back. All round, a fantastic purchase! If you want lots of compliments, I recommend this top.